Facebook messenger is an app that is widely used by the people of all age groups, nowadays. The reason for its extensive use is its cost to operate. It is very affordable to use, just need an internet connection unlike SMS service which charge you for every message being sent. Apart from texting, people also use Facebook messenger to send media files or other documents just in few seconds. People can maintain regular connection with their international friends through this app, call them regularly, share pictures with them without paying anything extra. As per saying, its always good to be in the limit. But some people do not understand it and get trapped in troubles like online sexting, cyberbullying, extra marital affair, online dating with strangers etc. This may ruin the lives of many innocents. Here comes the need of Spy software- an app that can help concerned individuals to track Facebook messages of the target person, they actually care. The reason for monitoring someone’s facebook messenger can be any- to safeguard them or to track them just to check what they are doing online because they are connected with each other. Undoubtedly, Spymaster Pro is at the top of the world when it comes to the best Facebook Spy Android apps. The reason being, Spymaster Pro has exclusive features, excellent customer support, and a reasonable subscription fees. It’s the perfect way to monitor someone’s Facebook messenger conversations without losing trust, remotely. The biggest reason for picking Spymaster Pro over other apps is its “safe to use” promise. All the information obtained from the target Android phone is encrypted and uploaded safely on Spymaster Pro customer account, ensuring it is safe from identity thieves and brokers. 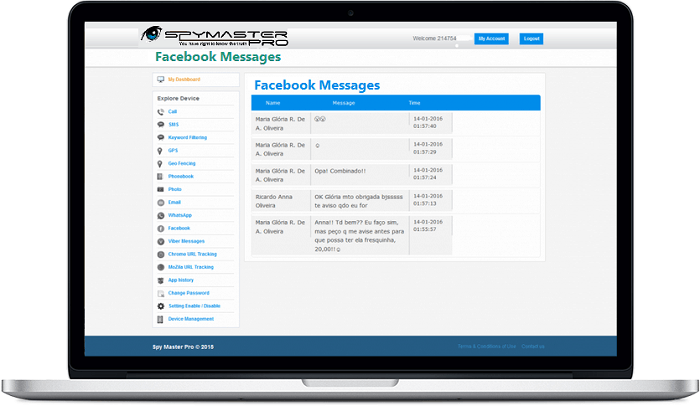 The second reason to go with Spymaster Pro is that recorded data can be viewed and analyzed anytime, anywhere, and from any device.